If there’s a consistent theme with Tesla’s announcements, it’s one of missed deadlines. Even Tesla’s latest Master Plan Part II—where they said wanted an all-electric big rig—arrived a few days late. Meanwhile, Daimler followed up their electric big rig announcement this week with photos of an actual one already testing. Daimler’s Mercedes-Benz Urban eTruck is a heavy-duty, three-axle 26-metric-ton big rig that would blow the Bandit’s beer trailer doors right off with sweet electric torque. Daimler plans to give it a range of approximately 120 miles per charge, making it perfect for cross-town deliveries, particularly in urban areas that are limiting internal combustion engine-powered traffic due to emissions concerns. The zero-emissions hauler concept in testing now comes equipped with an enormous 212 kWh battery pack with three lithium-ion battery modules, reports Electrek. Additionally, it uses CCS DC fast-charging at 100 kW—a rate Electrek wasn’t impressed with, but one that the electric-vehicle fan-blog hopes will improve before production. 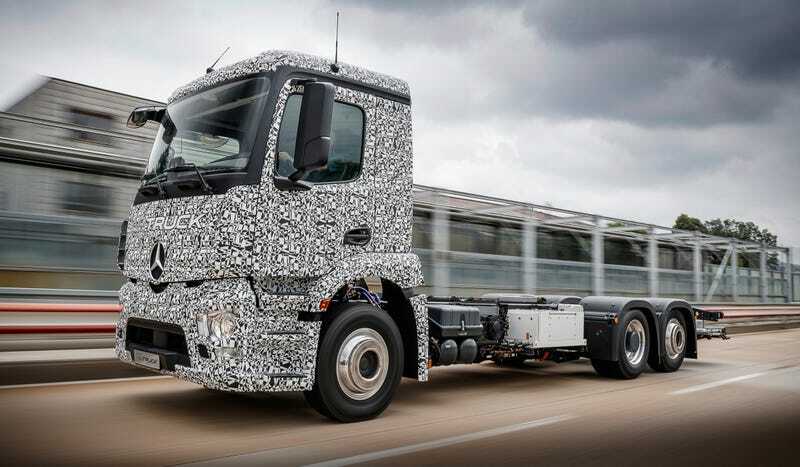 While the truck is based on a fairly standard Mercedes heavy-duty truck design, its rear wheels are now powered by electric motors adjacent to the wheel hubs—an idea Daimler took from its hybrid Mercedes-Benz Citato bus. As for beating Tesla to the punch, Daimler had a considerable leg up insofar as customers have already been testing out their Fuso Canter E-Cell light distribution trucks since 2014. Will Daimler beat Tesla to market in the quest to make distribution cheaper and cleaner, though? That’s to be determined. Daimler wants to put the Urban eTruck into production in 2020, while Tesla is aiming to reveal their Tesla Semi next year, reports Electrek. Gotta hand it to ze Germans, though. They’re usually good with ze deadlines. Given Tesla’s recent history with its self-imposed deadlines, maybe we’ll see both Tesla and Mercedes on the market with an electric big rig at approximately the same time. In the meantime, here’s are a few more shots of the new Mercedes wonder-hauler revealed today. Behold! It exists!